Be the first to share your favorite memory, photo or story of Mecildes. This memorial page is dedicated for family, friends and future generations to celebrate the life of their loved one. 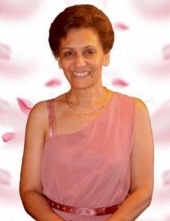 Mecildes Da Gloria Dupret De Melo Tavares, 61, of Holbrook, passed away Wednesday, January 23, 2019 at her home. She was the wife of Carlos Alberto Tavares; mother of Carla Tavares Duarte and Gerson Tavares; daughter of Maria Dupret; sister of Carlos Dupret and Lenira Tavares; she is also survived by 3 grandchildren. Funeral services will be held in the Nova Alianca Church of Nazarene, 38 Mystic St., Brockton on Tuesday, January 29th at 10:00AM. Interment will follow in Melrose Cemetery, Brockton. Calling hours in the church on Monday 5:00-9:00PM. "Email Address" would like to share the life celebration of Mecildes Tavares. Click on the "link" to go to share a favorite memory or leave a condolence message for the family.